Welcome to Pools of the Kai! 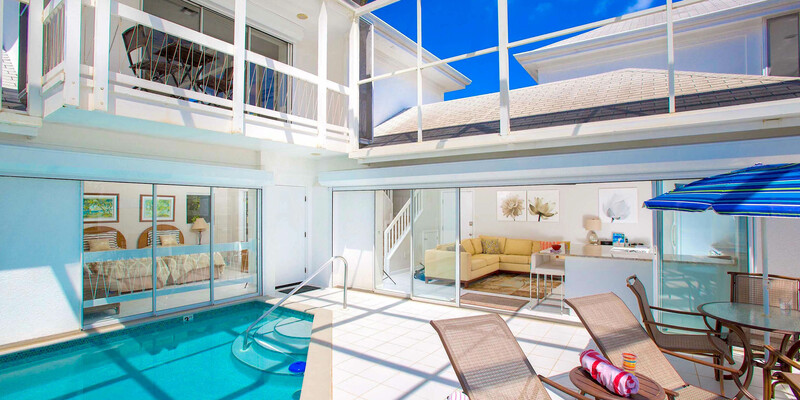 Pools #6 is one of the nicest 2-bedroom, 2-bath homes in this beachfront oasis. 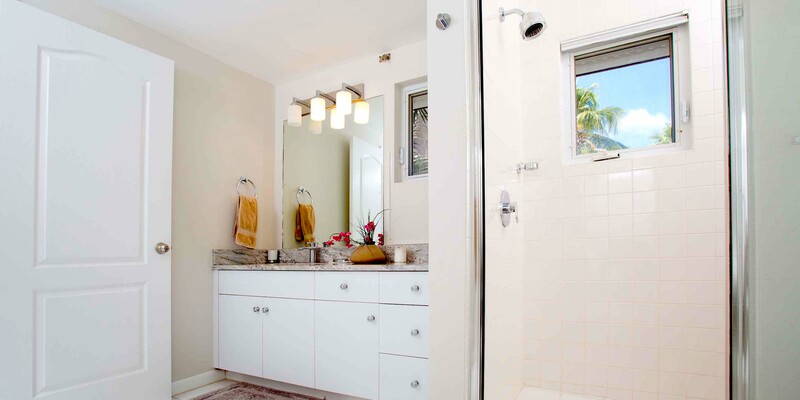 The condo has been fully renovated and redecorated down to the tile around the enclosed pool and both en-suite baths. Plus, the location cannot be beat. Walk barefoot to the Kaibo Yacht Club and Rum Point for drinks and dinner, or take a kayak tour of Starfish Point and Bio-Bay. Staying at the Pools puts you center to the best Cayman Kai has to offer. New furniture, finishes, granite countertops, and modern kitchen appliances give Pools #6 a sophisticated feel. The living area features sliding glass doors that open to a screened pool atrium complete with patio furniture and loungers. 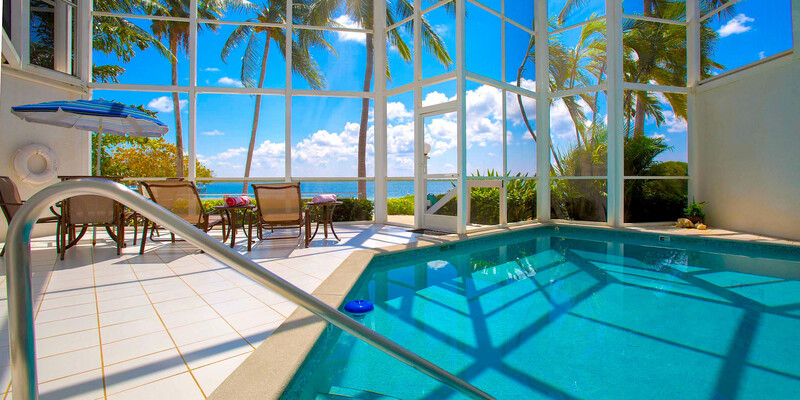 Soak in your own private pool and enjoy the stunning ocean views from the comfort of your home away from home. Optional pool heating is available year-round for a daily surcharge of $25. Pools of the Kai #6 sleeps four guests comfortably across 2-bedrooms with a king bed and 2 twin beds. The master king suite is on the second floor with private en-suite bath and balcony overlooking the screened pool atrium. 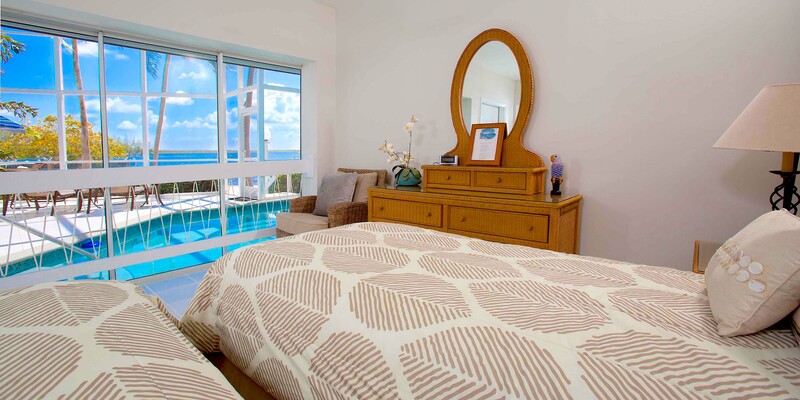 The twin bedroom is on the main floor with en-suite bath and views of the pool deck and beach. The twin beds can be converted to a king upon request. 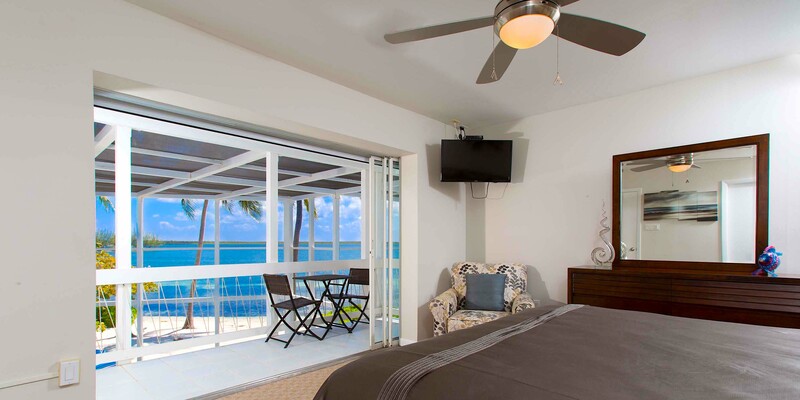 The location and amenities at Pools of the Kai are perfect for travelers looking to escape the crowds of Seven Mile Beach. The white sand beach behind the Pools of the Kai units is pure, barefoot beach sand. One can easily walk 120 yards to the Kaibo Yacht Club for drinks, meals and watersports, as well as charter boat pick-up. This quiet area faces south so in winter months a cold front may bring winds from the north or east, the Pools of the Kai tend to be quite calm. Facing the sound, the ocean water behind the Pools of the Kai is clear and calm. There are no reefs here teeming with marine life, nor is the sea bottom sandy. All beaches in Grand Cayman are technically open to the public. For a barefoot beach swimming experience we recommend walking across the street to the "Gardens of the Kai"or head over to Rum Point (2 minute drive, 10 minute walk). 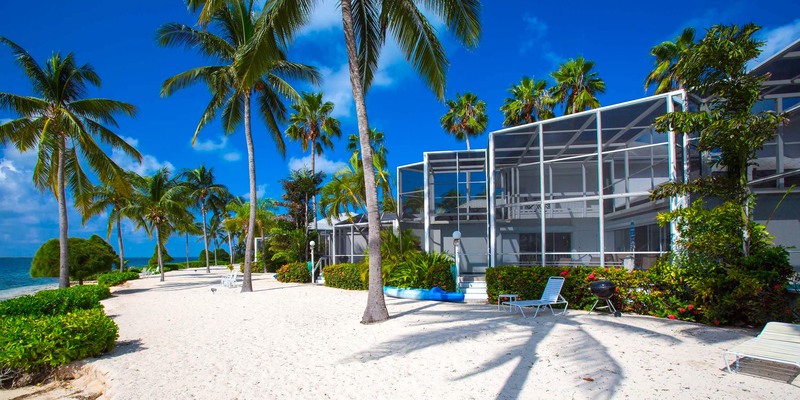 Not only is the beach there swimmable, the Rum Point Club also offers a bar, grill, lounge chaises and a diverse water sports menu to keep you active. Of course, there is nothing wrong with sitting on your lounge chair at Pools #6 and watching the sun sink in the west with your toes in the sand and a beverage in your hand! From the initial booking to arriving and opening the front door it was truly exceptional . The accommodation is perfectly located you never need to wear shoes. The villa is extremely comfortable, very clean and spacious. If you choose to go out there is so much to do with all the information to do that provided, but with a heated swimming pool and the ocean outside your door, why would you. I would recommend it as a six star holiday with everything on your doorstep, it was truly sublime. Excellent. Very clean well stocked and well furnished. Quiet during our stay. Easy to work with. My first thought was, there are no curtains or blinds anywhere, but then We realized We wouldn’t have the views that we did! We used the pool everyday, watched the sunrise from our bed, and spent so much time on the screened porch and oceans edge. Great area to snorkel, kayak, swim and relax. Can’t wait to come back next year! This is the 3rd time I have rented Pools of the Kai 6. It never fails to be a great experience. Perfect location great layout. 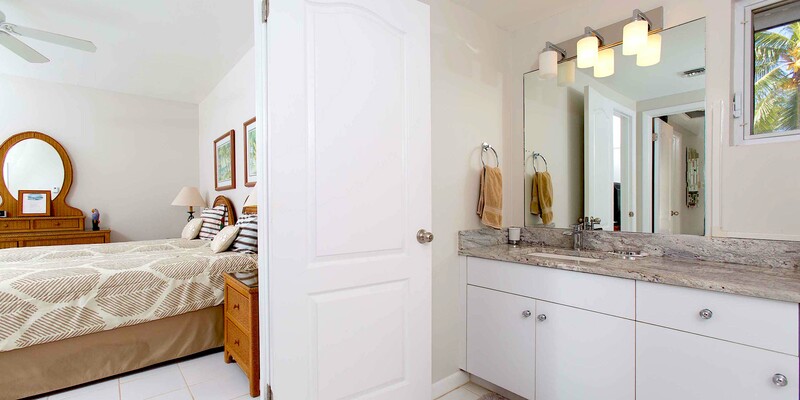 Large bedrooms and baths. Screened in two story patio and pool are great for being outdoors. Only a few steps from water on a nice sandy beach . Nice short walk on the beach for two restaurants and a coffee shop. Will definitely being booking it again. 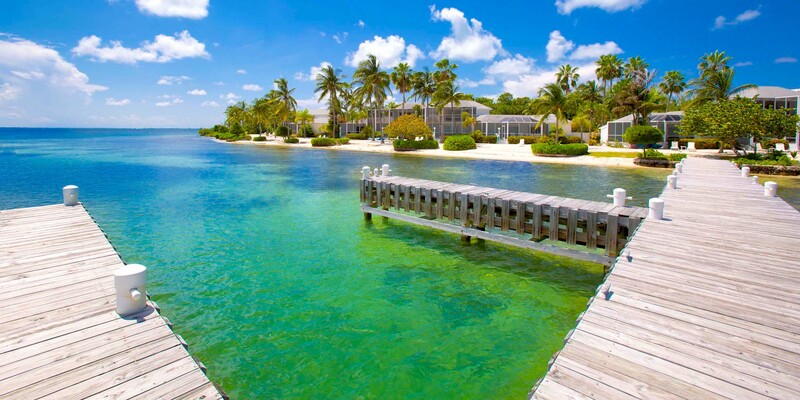 Have booked 5 different properties through Grand Cayman Villas. Always good service. We enjoyed staying at the condo. The condo had most everything that we wanted. The beach was very convenient and pleasant for swimming, and other water sports. The people we dealt with were very nice and helpful. We were a bit isolated on the Island but very much enjoyed the peace and quiet. Its a significant ride to get pretty much anything other than to the club down the beach. 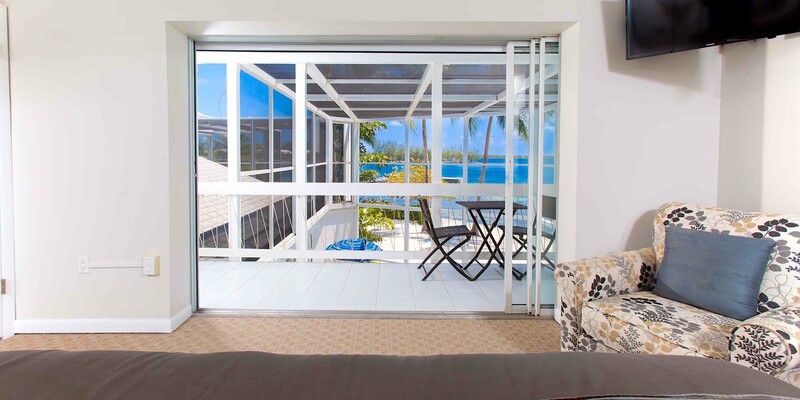 We loved everything about this unit from the location to the views to the pool. The unit was clean and very comfortable. It was a great jumping off point for activities and perfect for relaxing. We had a minor issue with the air conditioning in the downstairs bedroom but the owner and property manager were very responsive and the issue was quickly resolved. We had a wonderful vacation! We loved the location of the property (close to Rum Point). It is a quiet area on the beautiful water. The kids loved the kayak and paddleboard at the house. The beach is excellent. Very close to Kaibo Beach dock where you can pick up ferry to Camana Bay and can also rent private boat for fishing or sting ray city and will pick you up there (saves alot of time). The house was perfect for our family of four. Everything was working as advertised. It was 87 degrees everyday and the AC was working overtime and felt great. 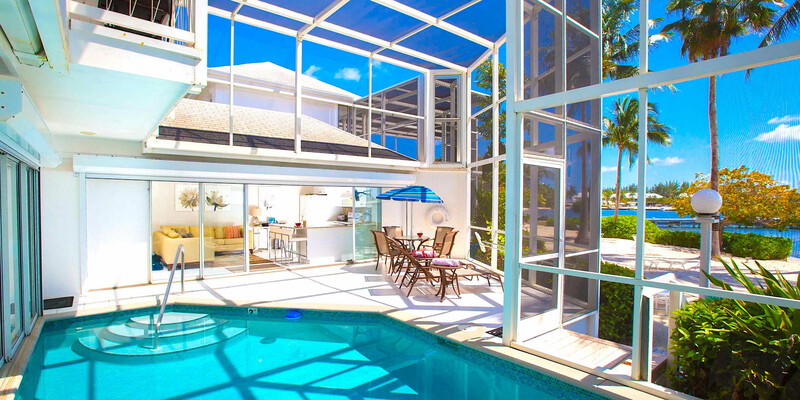 The screened in portion with the pool is fabulous. I sat out there watching the kids in the water for hours and never applied any lotion on myself and never got burnt. The pool is great for a short dip! The property manager, Roland meet us there on our arrival, showed us around the property , and made sure we had his number if we needed to contact him. The hair dryer was not working at the property, we called Roland and he dropped off a new hair dryer for the property. Without question, we would rent this property again! Our family of 4 had a great relaxing vacation. Pictures are spot on and the view is amazing. We had our daughters 14/16 and we had plenty of activities to do and used the pool daily. Starfish point is around corner from property where we could snorkel and swim. Kaibo was great to walk down beach and grab a drink and eat. We went to Rum point to play beach volleyball and hangout on a hammock. If you plan on cooking you will need to purchase all baking needs, oils spices etc since what is on hand is limited. Plenty of coffee filters though. The place really allows you to get away from it all and enjoy time with family. Very nice place to stay, everything worked as described. Perfect size for a 2 kid family (we were 2 adults 1 kid, 17). Very nice layout. Do plan some meals in advance and cook at home, dining out is extremely expensive in Grand Cayman, add 25% to the prices and then mandatory 18% tip. There are great grocery stores on the way out to Rum Point to stock up on, the coffee has both a Keurig and traditional coffee maker. If cool pool water is an issue, pay the extra for the heated pool. The temp inside defaults to 69 degrees, so at night it gets a bit chilly, but was not an issue to adjust the temp as needed. You will need a rental car to go anywhere expect Kaibo restaurant. Over the Edge restaurant was OUTSTANDING, every thing else was so-so. Highly recommend the place, you will not be disappointed. We had a great vacation and the house was really nice. Comfortable, had everything we need plus an awesome view. We would totally stay there again! Our family just returned from our fantastic week stay at Pools of the Kai #6 for my husband's 50th birthday. 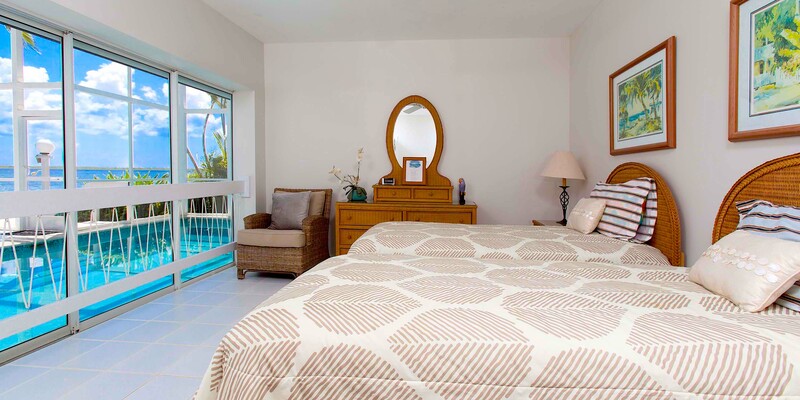 Prior to our arrival, the team and Grand Cayman Condos and Villas provided us with a superb amount of information about the unit, the surrounding area, groceries, rental cars and excursions (thank you Scott, DiDi, Rhonda and Jim). The app was so helpful! The property manager Roland greeted us on arrival and showed us around, answered any questions we had. The unit was clean and newly updated. Kitchen was well equipped, which we greatly appreciated. The bedrooms and bathrooms were spacious and the beds were SO comfortable with a great working a/c. The indoor pool was such a nice feature and we enjoyed having it heated - it was oh so relaxing. We loved being walking distance to the Kaibo marina and if you have the chance, visit the coffee shop and enjoy one of the best Iced Lattes you'll ever have! During our stay we booked a snorkeling charter with Silver Thatch Charters which also included a visit to stingray city - we would highly recommend this charter if you have the chance - Captain George was awesome. You'll definitely need to rent a car to get here, it's about 45 minutes away from the hustle and bustle of Georgetown. If you are looking for a relaxing and serene vacation in a beautiful location, this is the place for you. We can't stop talking about our stay and are already talking about planning our next trip. Great house! Loved our stay there was so relaxing and private. The house is gorgeous. Would definitely go back and recommend to anyone. Wonderful property in a great location! We had an amazing week here. We are so glad we chose to stay in this area rather than the more touristy west side. The house met every need. The upstairs AC unit quit working and they sent someone out to fix it same day. We can't wait to go back. The condo was great and comfortable. The property manager was there and available as needed. The screened in porch was nice. Never got in the pool but it looked nice. Bathrooms were spacious. The TV system was bizarre and each room got different channels. None in main room. Close proximity to the Yacht club and the view was nice. The beach is narrow and not positioned for swimming etc. Nothing like 7 mile beach. The kayak was a nice touch. Overall we enjoyed our stay there. Condo is spacious, well-equipped and in a great location if you like peace and quiet. Accommodated our family of four adults brilliantly. Highly recommended. 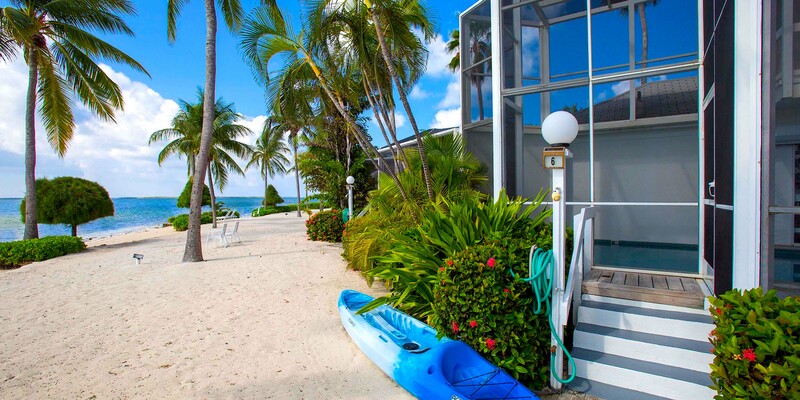 The property is very well maintained and located in a beautiful spot on Rum Point. 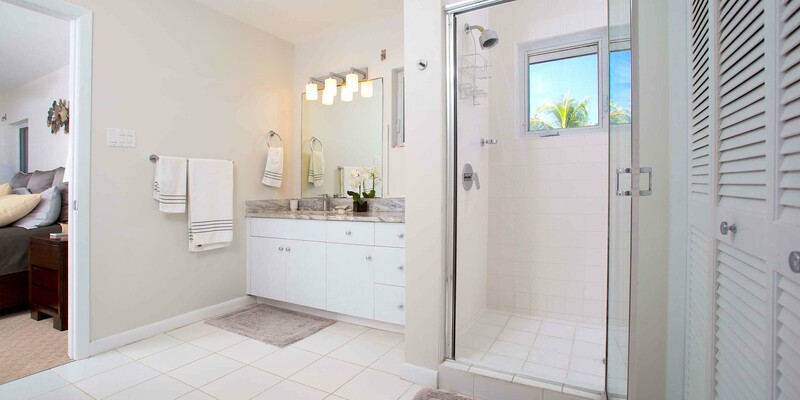 The interior is pretty basic and clean, but felt that the bathroom towels, rugs and rugs throughout could definitely be updated. We would come back to Pools of the Kai #6 in a heart beat! 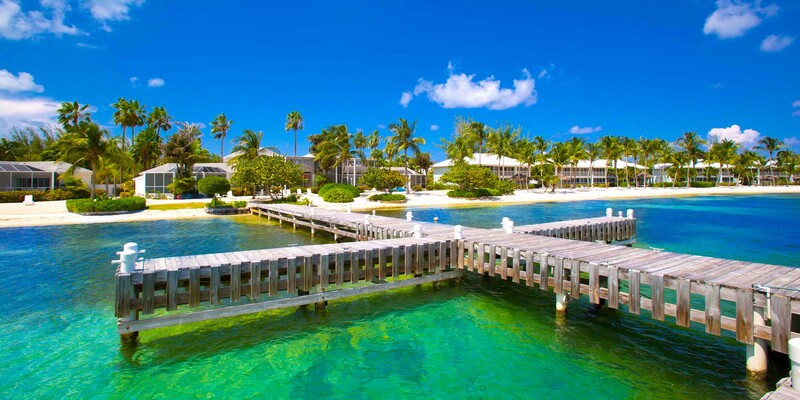 Rum Point is a great place to stay when visiting Cayman Islands! Great accommodations. Villa is in a great location and has everything needed for a great time! Location is close enough to everything needed without being in the crowds of other places. Villa air conditioning worked very well as did all the appliances. Recent Villa updates were done well. Good to take water shoes for the grassy sand area in the bay. Bluetooth speaker provided worked great. The condo was in a beautiful, peaceful location. Our kids loved swimming in the pool while we could sit there and enjoy the ocean view. The property was very spacious and well decorated. We would definitely recommend this property for families. We felt like we were staying where all the locals like to go! Loved watching the boats come in and out of Kaibo club. Grilled outside of our place several times, everyone around us was super friendly. Quick to get to Rum Point and lots of fun beach spots on our way to the East end. The unit was private and relaxing. Wonderful sunrise and we walked to Starfish Point for the sunset. We will definitely go back. We stayed at #6 for 10 days and had a great time! The photos represent the property very well except for the kayak which is only a single, not a tandem as described. Other than that, we were very happy with our stay, the location and the beautiful setup with the sliding doors out to the pool deck. You will definitely enjoy yourselves in this home. Unit 6 at the Pools is a fantastic condo. It is even more beautiful and spacious that the photos suggest. 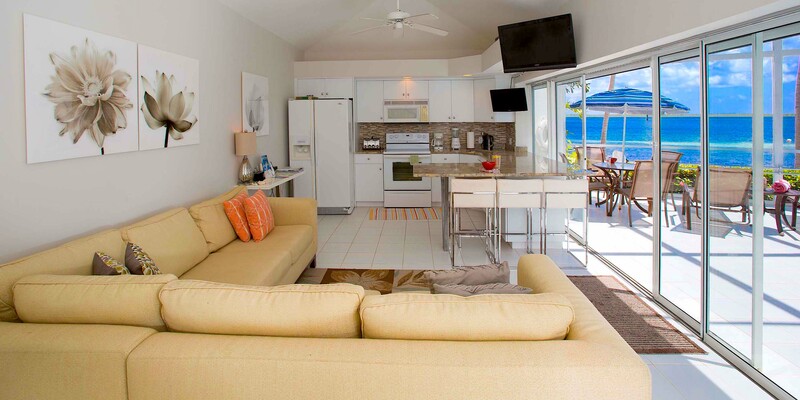 It is very well designed and has everything you need to relax and enjoy your stay on the island. I had no need to contact management for any issues as everything they included in the descriptions of the condo and during the rental transaction were complete and accurate. The condo has a dual zone AC unit which was essential in the hot July weather, and it worked great. The swimming pool is lovely and we used it much more than I thought we would, especially in the evenings to wind down after a long day. If you've never been to Grand Cayman, the Rum Point area where the condo is located is pretty far off the beaten path, and it takes a least an hour to drive from there to get to 7 Mile Beach. This is a plus from my perspective as I like the quiet laid back feel of this part of the island. However if you are planning on spending a lot of time in town or on that beach, you will be doing a lot of driving. I would recommend a visit to Cayman Crystal Caves, a relatively new attraction located just a 10 minute drive from the condo. The cave formations are beautiful and it is a great experience for kids. The Kaibo restaurant has great food. We ate there a few times, but had at least half our dinners at the condo. Having a charcoal grill was great. You can buy fish directly from the fishermen at the fish market in Georgetown, to toss on there. We had a wonderful time, and I would not hesitate to recommend this condo to anyone wanting to get away from it all in Grand Cayman. 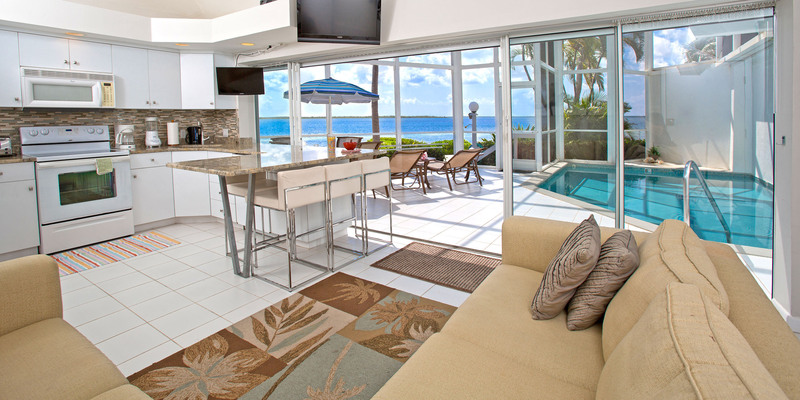 We just returned from our Grand Cayman family vacation and loved staying in this villa! 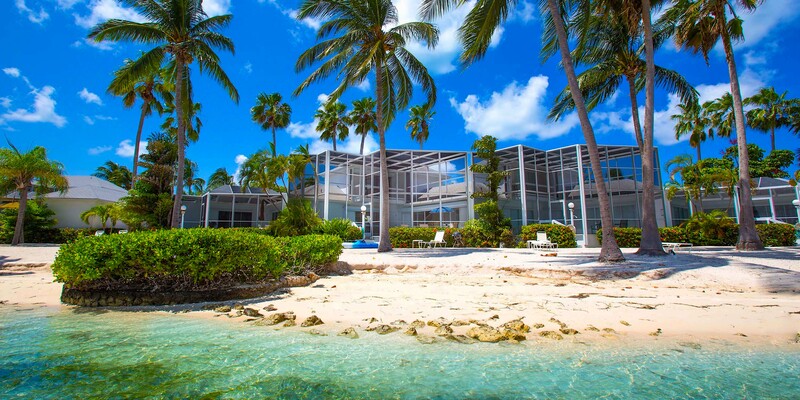 The beachfront property was quiet and secluded, far from the noise and activity of Seven Mile Beach. Enjoyed being a short walk from the Kaibo Yacht Club, where we found convenient, relaxed meals on the beach, not to mention our morning latte at Kaibo Espresso! Rum Point is just up the road, we had a rental car(a must for this part of the island) and did some snorkeling at Rum Point and the Bio-luminescent Kayak Tour with Cayman Kayaks. You could walk to Rum Point, but it was easier to drive. Starfish Point is a short walk or kayak ride away. We did venture to other parts of the island, but we were always happy to come back to our tranquil villa. The villa is exactly as pictured with the exception of the lower bedroom, the bed can only be a king, not two twin beds. I believe the mattress was updated, but the pictures on this site have not been. Highly recommend this property! Great time! we enjoyed the condo and all the amenities. We had a lovely weekend with a few hiccups, The first night the downstairs air-conditions were not working, but a bad thing turned out to be a good thing, my kids and I all bunked upstairs together and it was like old times slumbering watching tv, sharing stories and laughing. The following morning the A/C mechanics came to fix the problem. We had use of a boat dock on property for our boat with the exception of fresh water. while washing off the boat the water was turned off on us. despite the our 2 problems we had a wonderful staycations at the beautiful Pools of the Kai #6. well maintained and equipped condo. Thank you! Our condo was a perfect fit for our vacation! Great place to relax, with our our little beach! Management was very helpful for the entire process of booking to every detail in our little home away!! Would definitely return! We had an amazing vacation !!!! Our first time to the Cayman islands, Most beautiful place I have ever seen. The Condo was perfect, absolutely nothing wrong with, the pictures on the website tell exactly how the condo looks like and surroundings. we stayed for 10 days and had a unforgettable vacation. if you like a quiet place than this is the place to go. we had the whole beach for ourselves the 10 days . A must do is going to Stingray city, we did it twice, we loved it so much. We also did horse riding on the beach, if you are a experienced rider, do not do this. you are only allowed to stay in line and walk, my husband said it was lame and he felt like a city slicker. If you love to snorkel or diving this is the place to go . We did all the sight seeing there is to do on the island and we had a very good time. last thing, everything is very expensive on the island, but it was worth it ! If you are on this side of the island, please do rent a car.